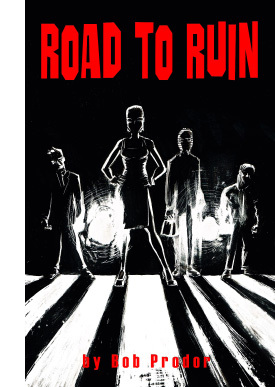 Road to Ruin is here! Please click here or on the image to preview (now displays on the iPhone, iPad and iTouch!). The 128 page graphic novel is published and in stores now- I'm getting reports from West Edmonton Mall to Hamilton, Ontario! It feels great to have this fulfillment of a lifetime of work in my hands and in stores! Please feel free to pester your favourite store to order copies, and if you see one in stores let me know so I can tell everyone! ALL IMAGES © 2012 BOB PRODor, All rights reserved.